The Environment Agency joins forces with the Health and Safety Executive to carry out combined visits to waste sites in the North East. The Environment Agency has joined forces with the Health & Safety Executive (HSE) in the North East to carry out combined visits to check waste sites aren’t flouting important legislation. 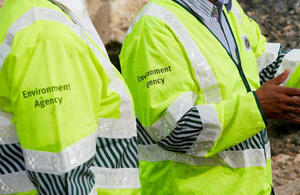 This ongoing multi-agency approach aims to improve working practices on regulated sites. During the last series of visits at the back end of 2016, staff attended 13 sites across the region, with more visits proposed for the early part of the New Year. To date the joint initiative has focused on sites that recycle, process or store waste metal, such as scrap vehicles and general waste metal. Operators use a variety of processes and equipment to strip, cut and burn waste to extract the key metal and components, work which has the potential to expose workers to risks to health and safety. The aim of these visits is two-fold; to make sure the sites are operating within the conditions of their Environmental Permit to protect the environment and community, while ensuring the health and safety of workers isn’t put at risk. We manage our permitted sites every single day to ensure they are operating within the law, to protect the environment and to minimise impact on the local community. Health and safety is paramount when our officers are visiting sites and officers regularly contact HSE if they feel a site is unsafe. These joint operations are a really good opportunity to share knowledge with other agencies and mean we look at the site from different perspectives, ensuring any issues impacting on the environment and community can be looked at together with site safety. An average of 7 people are killed each year in the waste industry, this includes members of the public. The main causes of death are people being run over or struck by a moving vehicle or something unstable collapsing on them. A high number of workers in this industry are also exposed to processes that cause irreversible ill health conditions. During the last joint initiative HSE found 8 sites visited to be in significant contravention of health and safety law with 7 Enforcement Notices served. Joint operations such as this mean we can work alongside the Environment Agency to make sure those responsible for the sites are not exposing workers, members of the public and the environment to harm from the operations they undertake.